Maybe it’s a character flaw, but to be inspired to walk, run or bicycle, I need a destination. That destination may be somewhat impractical – this is the time of the year, for example, when I try to talk the husband into strolls through the back, sorta swampy part of Piedmont Park, in hopes of spotting snakes. I’ve also had a bit of success getting him to stroll to the dog park, even though we have neither dogs nor any intention of getting dogs. But the walk is a slog, time-wise, 20-something minutes each way, with refrigerated items suffering in the sun all the way home on hot, sunny days. Not to mention my tendency to suddenly remember that I need 3 pounds of apples AND 3 pounds of potatoes, adding unplanned weight to the bags. My rarely-used bicycle was, of course, the answer, but the only suitable bag choice, my reliable black JanSport book bag, didn’t hold very much, left a big sweat stain on my back and made the ride home less than enjoyable. Finally, the husband remembered than panniers were a thing, and we were soon ordering bags and a rack from Nashbar. The Townie was our bag (technically basket) of choice, and we chose the Axiom Journey bike rack to hang it from. The verdict? So far, so good. The bags hold a little more than I usually get during a standard shopping trip, and the three attachment accessories (hooks, Velcro and a bungee cord) mean they don’t bounce around too much, even with filled with groceries. 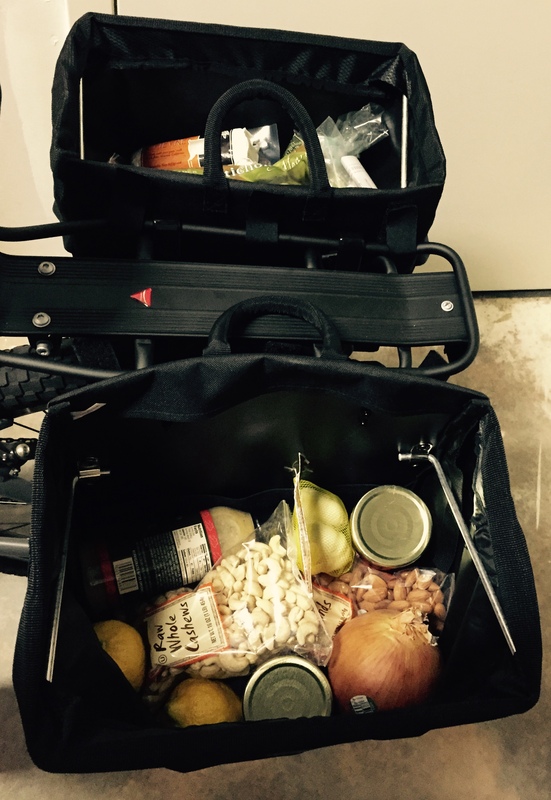 As you can see, I forgot to bring bags to put inside the bags during the excitement surrounding my first trip with the new setup; the Townies are especially sturdy when the groceries are secured inside another bag and, therefore, aren’t bumping around inside. The travel time to Trader Joe’s has been reduced to a mere 10 minutes, provided I catch the light at 10th and Monroe the right way, and go full speed down every available hill (which, of course, I totally do). The trip back takes a couple of extra minutes – you can’t go downhill on both parts of the journey, after all, and no matter how well-balanced the load is, it still adds weight to the ride. All that time saved means more time to look for snakes and watch dogs. And I haven’t even mentioned the chipmunks.